The Badge Buddy is ideal for holding your staff ID cards, visitor cards, student ID cards, membership cards, photo ID cards, event passes, ID permits, identification cards plus any other cards. The Badge Buddy is the premier of Badge Holders which is made from strong completely clear polycarbonate giving the best protection of pretty much all of our cardholder range. The overall size of the holder is 90 x 62mm plus the clip. The Badge Buddy will hold up to 2 standard sized photo ID Cards (86 x 54mm). 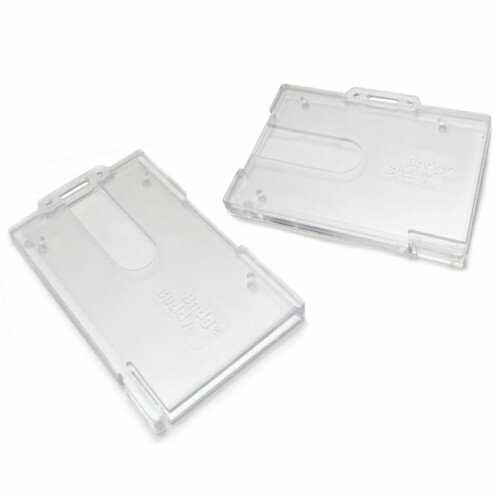 The Badge Buddy from ID Card Centre is clear to both sides so can be used to display both sides of your card or for two cards. The Badge Buddy comes with a thumb slot to the rear to enable you to easily remove your cards – perfect if you are using mag stripe cards or indeed utilising our braille stickers. These Badge Holder can be used with badge reels, clips, lanyards or chains.